Thomas Richards Charity collaborated with Classic Lanes in Rochester Hills, MI to host a bowling fundraiser on February 26, 2011 to support Traci and her family. Traci was diagnosed in 2007 with Sacroidosis after suffering a stoke with. Sarcoidosis is a inflammatory disease that can affect almost any organ in the body. It causes heightened immunity, meaning the body cannot fight infection and disease because the immune system over reacts, resulting in damage to the bodies own tissues. There is a formation of granulomas, which are microscopic clumps of inflammatory cells that group together. 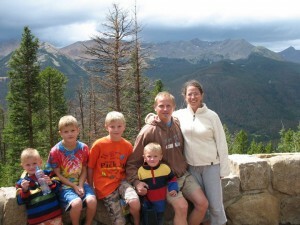 This has affected not only Traci’s lungs, but also her heart, brain, and skin. This disease is very rare and unfortunately there is no cure; Sacroidosis is fatal. 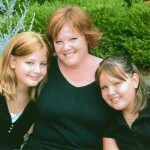 Traci also has two girls Hanna and Megan. 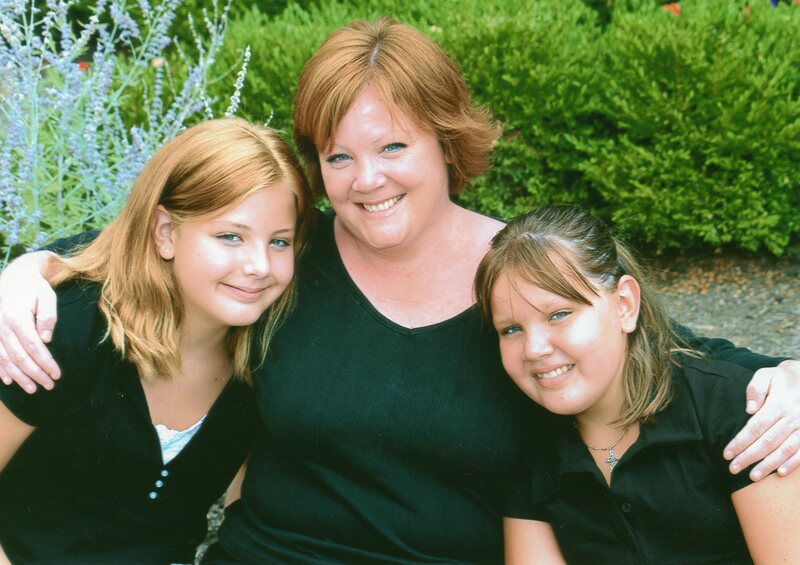 Traci needed our help in order to financially support her girls, medical bills, and to give them wonderful memories with their time left together. With the help of the community the fundraiser was a success with many supporters who showed up and had a wonderful time bowling and supporting Traci. 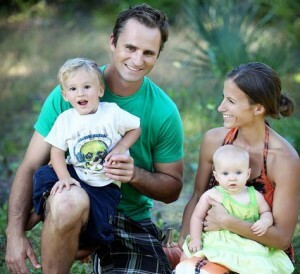 Thank you to all those who contributed to memories made between Traci and her girls. Thank you. 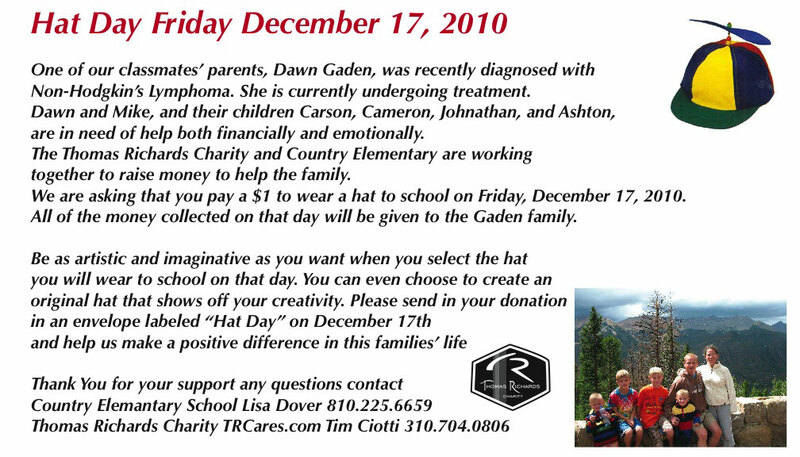 On December 17, 2010 Thomas Richards partnered with Country Elementary School to host a Hat Day to benefit the Gaden family. 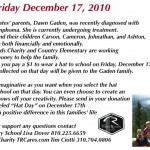 A parent of classmates, Dawn Gaden, was diagnosed with Non-Hodgkin’s Lymphoma; to support Dawn and her family emotionally and financially we asked the Elementary’s affiliates to where a hat and donate $1 that went directly to Dawn and her family. 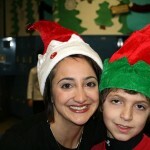 The hat day event at Country Elementary School for Dawn Nardi was a success with over $950 raised for the family. 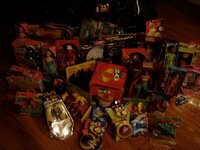 Thank you to Lisa Dover and all the Kids that helped. Thank you for helping us help them.